China is a country of immense variety in its terrain and geography, but the story of modern China is often told through its cities. According to Public Radio International, for the past two decades China has built twenty new cities each year. These urban centers draw people from China’s countryside and from around the world to take advantage of new economic opportunities. Start your China trip around fifteen of China's most important cities. 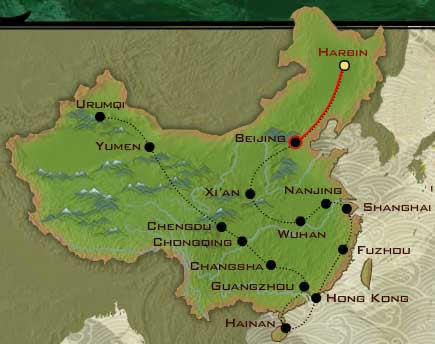 Harbin: Next Stop, Ice City! The northern city of Harbin grew as a railway town when the Russians linked their western outpost, Vladivostok, to the city of Dalian in China. More than 100 years later, this industrial city in northeast China is known for its beauty. Visitors can walk the cobblestone streets and enjoy the elegant spires and cupolas of Orthodox churches and other buildings constructed by the many Russians who settled in Harbin after fleeing the civil war of 1918. Just outside the city, magnificent Manchurian tigers are on view at the nearby Siberian Tiger Park conservation and breeding center. Visitors and locals alike cheerfully brave Harbin’s long and cold winters to see the world-famous Ice Lantern Festival. Teams from all over the globe come to recreate architectural wonders or themes from history and fairy tales—all in ice and many several stories tall. At night, the sculptures are illuminated with (some say beautiful, others say gaudy) colored lights. Beijing was born to be a world capital. After being burned to the ground by Chingghis Khan in 1215 CE, Beijing was built anew as the capital of the vast Mongol Empire under Chingghis’ grandson, Kubilai. Today, Beijing (best destination for last minute China travel deals)is the capital of China. It is home to top universities, numerous museums, and national treasures such as the Forbidden City, the Temple of Heaven, and the Summer Palace. Many fear, however, that Beijing’s most distinctive treasures, like the winding hutong alleyways, are being lost to progress. Lined with noodle stands, markets, and doorways to private courtyards, hutong ring with the sound of the distinctive Beijing accent known for ending words with an "r”-sound. It used to be said that in Beijing, the hutong were more numerous than the hairs on an ox. Today, though, most have been razed. In their place, world-class architecture such as Herzon and de Meuron’s Beijing National Stadium, the seat of the 2008 Olympic Games, has arisen. Beijing worked hard to win the Olympics and Beijingers look forward to 2010 as the year when their city will be on top of the world. One could easily say the heart of China is buried in Xi’an. The countryside around the city holds treasures from China’s Neolithic beginnings and from some of its greatest empires. For over 2,200 years almost nine thousand terracotta troops have stood guard over the elaborate tomb of China’s first emperor, Qin Shi Huang. The army was first discovered by farmers in 1974, opening a great treasure to the world. Excavation of the elaborate tomb, said to have been built by the labors of 700,000 people, is still continuing. The great Chinese historian, Sima Qian, writing 100 years after the tomb’s construction, told of rivers of mercury and ceilings dotted with constellations of gems. During the Tang dynasty (618-907 CE), the network of trade routes now called the Silk Roads linked Xi’an to South and Central Asia as well as Europe. With over a million inhabitants, Xi’an was the world’s most populous city. It boasted goods, fashions, and music from the world over and was home to diverse religions such as Buddhism, Nestorian Christianity, Judaism, and Islam. Visitors today can see numerous Buddhist temples, such as the Big Goose Pagoda, built in 652 CE. Islam arrived via the Silk Roads and today Xi’an (where you can start your Silk Road tour ) is home to one of China’s largest mosques. Straddling the juncture of the Yangzi (where you can have Yangtze River tour) and Han rivers, Wuhan is actually a marriage of three towns—Wuchang, Hankou, and Hanyang. Three bridges cross the rivers and unify the towns into the largest city in central China. River traffic and tourism are staples of Wuhan’s economy and will only grow with the completion of the Three Gorges Dam. In Wuhan, people admire the tall and graceful form of the Yellow Crane Tower, originally constructed around 220 CE, and rebuilt in 1981. In summer, they strive to beat the heat, perhaps diving into the small street restaurants to enjoy the local specialty regan mian, “hot and dry noodles.” Wuhan is considered the hottest of the sanlu or “three furnaces” of China, the other two being Chongqing and Nanjing. The humidity pushes down while the temperature soars to 104°F in summer. While Wuhan further up the Yangzi River is considered the hottest of the sanlu or “three furnaces” of China, it is Nanjing that has the reputation for boiling over. In the fourteenth century, a peasant named Zhu Yuanzhang led a rebellion that toppled the Mongol Yuan dynasty (1279-1368). He established Nanjing (literally “Southern Capital”) as the seat of the Ming dynasty.